Landscape architect, countless award-winner, professor, author, visionary, innovator and Sports Illustrated person-of-note: these are just a few of the hats Phil Lewis has worn, and still does. For over half a century he’s been a force in Wisconsin, and across the planet, for environmental protection and stewardship. “As a kid, you want to see your dad in Sports Illustrated – Dad did that in 1967,” quipped Lewis’ son, Andy, himself a former member of the Middleton City Council. At that time, SI published an in-depth article featuring Lewis entitled, “How To Stop The Pillage of America.” It explained Wisconsin’s forward-thinking statewide recreational planning effort, Lewis said. Professor Lewis, 88, would love to see popular magazines once again tackle and highlight environmental concerns. After all, he’s given his life to this point for the good of the planet, gathering environmental data, sifting, winnowing, thinking, advising and acting. He continues to do so to this day, nearly six decades after his noteworthy career began in Illinois. Fortunately for Wisconsin, he came here by way of the University of Illinois and Harvard. Affiliated with the University of Wisconsin for more than 30 years, his journey of impact began on the Capitol Square. On his first day at work in the capitol in 1963, he met with Governor Gaylord Nelson, founder of Earth Day. Nelson charged Lewis with the daunting task of taking a statewide inventory of the natural and cultural resources in Wisconsin’s 72 counties - with a view to advising legislators which parcels of land the state should buy. Because of a one-cent sales tax on cigarettes, the state had $50 million in its coffer slated for land acquisition. The all-encompassing project was entitled the Statewide Recreation Plan, and measured what was important to the public, Lewis explained. “I said, ‘If I’m going to do a study of the whole state, I need a war room,’” Lewis remembered. Capitol staff found him just the spot – a little two-story inner vault. After ripping out the rusty filing cabinets “that hadn’t been opened since the 1800s,” Lewis and his team moved in. A spiral staircase snaked up nearly to the governor’s office, Lewis said. Every day, as maps depicting the painstaking inventory of Wisconsin went up on the wall, legislators could see the state unfold before their eyes, and hear Lewis’ explanation of the project. “That was the best way to inform the decision-makers,” Lewis stated. Lewis and his team identified 220 man-made and natural resources, everything from trees, to schools, to bakeries, “whatever the people cherished,” he said. Inspired by Boy Scout merit badges, they then created and assigned an icon to each type of resource, plotting the state. A pattern emerged. “Ninety percent fell into water, wetland and steep topography systems,” he said. “So if you protect those, you can see where the diversity in the state is located – basically in water corridors, like Pheasant Branch Creek,” he explained. From this pattern came the concept of e-corridors, or E-Ways – usable green space - which Lewis calls “life support systems.” The “E” represents: education, environment, esthetics, ecology and exercise. His next step was to create an example of an E-Way “in the backyard of the UW-Madison and Wisconsin’s capital,” he said. A grant in 1969 from the National Endowment for the Arts launched the development of the Nine Springs E-Way, a large tract of land partially in the Dane County Parks system, he said. It was the world’s first. This parcel of environmentally sensitive land, like other environmental corridors, allows for controlled recreational use. The irony of his father’s current residence is not lost on Andy Lewis. “He lives less than a block away from the Pheasant Branch Conservancy,” and a few blocks from the Middleton Hills street that bears his name: Phil Lewis Way. The son feels last week’s renaming of the world’s first E-Way befits his father much more than a “stretch of asphalt,” he said. In the early evening of September 12, the public celebrated the dedication of Madison’s notable E-Way – to be known as the Lewis Nine Springs E-Way. The title recognizes the work of its visionary creator as well as his wife, Elizabeth (Libby), who served for 26 years on the Dane County Parks Commission. In addition to the excitement of the Lewis Nine Springs E-Way dedication, both Lewis men are thrilled with a matching challenge grant to provide an endowment supporting education, interpretation, and volunteerism within the Dane County Parks, Andy Lewis said. “If the Dane County parks can raise $100,000, the Madison Community Foundation will provide a $50,000 grant,” he said. The family is contributing funds from a memorial to Libby and another $10,000 from a trust. Looking at an aerial map of the United States at night, Lewis pointed out the glowing glut of lights east of the Mississippi River, revealing intense urbanization. Noting the economic impact of tourism dollars as well as the environmental benefit, Lewis propounded something California and New York have already done: create state railway parks. Positive economic impact and environmental protection can go hand-in-hand locally and regionally, he said, citing another concept he calls “Circle City.” This is the area populated by 17 million clustered in cities from Illinois, Wisconsin, Minnesota and Iowa, he said. As for his start in the capitol so many years ago, Lewis readily credits Nelson for his foresight to protect Wisconsin’s natural resources. “There are pockets of people doing creative things, but we need another Gaylord Nelson who understands the requirements for a sustainable future,” Lewis insisted. He feels the urgency of examining the planet’s sustainability, and passionately argues for Wisconsin to take the lead, yet again. He believes Wisconsin can do it. Lewis bemoans the trifling amount of resources given to educating the public for explaining the motivation and importance of Wisconsin’s land purchases, insisting younger generations and legislators are both in need of education. The Pheasant Branch Conservancy is another example of a Dane County environmental corridor. Although Lewis aided Middleton’s identification and preservation of natural resources, he takes no credit for the Pheasant Branch Conservancy. Although he spent much time in the classroom teaching university students, he also traveled throughout the state practically applying his concept of Regional Design. Cities such as Boscobel, Muscoda, Spring Green and Beloit benefitted from his expertise in the field. Lewis understands the limited budgets of governments, and that they can’t preserve everything. His guiding principals have helped numerous communities decide what is crucial. 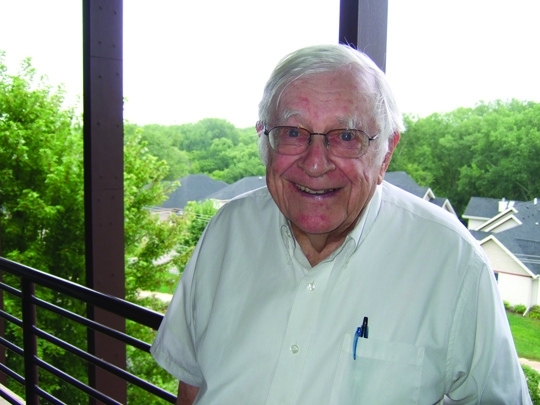 Awash with a lifetime of awards for his environmental and civic work, Lewis cited three standouts: the nation’s highest award in landscape architecture, the Jens Jensen professorship, and the Wisconsin Idea Award. The Wisconsin Idea epitomizes the practical extension of university research ideas and resources, he said. Lewis is pleased that his concept of regional design was recognized when it was first proposed, and that it is an integral part of curriculum even on a global scale. Former international students have taken back home knowledge gleaned from Lewis, and he’s heard of regional design projects in countries such as Taiwan, Poland and England, he said. In addition, universities and planning departments across the United States recognize his creation, e-corridors, as an integral part of curriculum and urban planning. Lewis, author of Tomorrow By Design, has lectured at the White House and all over the world. His Wisconsin vision from the 1960s has truly been globally significant.